A Wellingborough boy caught with a knife, ammonia and class A drugs has been put behind bars. The 16-year-old, who cannot be named for legal reasons, was sentenced to three years’ detention at a young offenders’ institution at Northampton Crown Court on Monday (March 12). 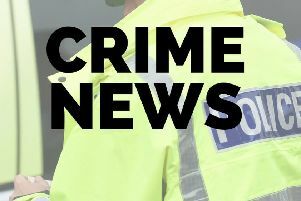 He pleaded guilty to weapons and drugs offences and was convicted of possession of a knife, possession of crack cocaine, possession of a bottle of ammonia and possession with intent to supply heroin and crack cocaine. The offences were committed in May, August and October 2017. Det Sgt Keith Morson from Operation Worcester, the Northamptonshire Police response to gang criminality, said: “We are pleased with the sentence passed by the court for these very serious offences. “We hope this sentence will help to deter any young person from engaging in any criminal gang culture. “The sentence shows that the criminal justice system will not tolerate this kind of activity, regardless of the age of the perpetrator. “This is not the first time a teenager from Wellingborough involved in gang activity has been sentenced to imprisonment, and I would urge anyone with concerns about children they think may be involved in this type of crime to contact us on 101 so they can access the relevant support and advice.